People love to embark on creative adventures. They love the journey of opening up, exploring ideas and discovering new things. 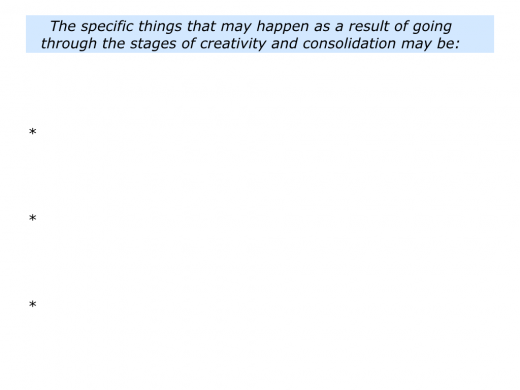 This is exciting and can lead to creative breakthroughs. 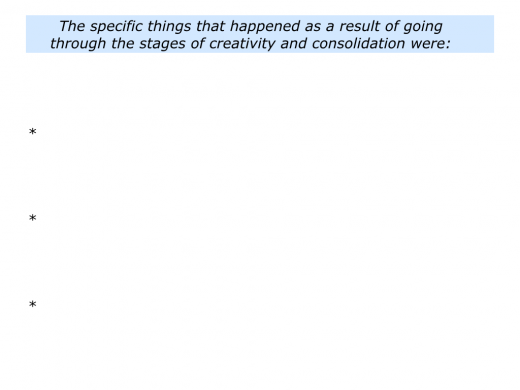 People also enjoy the process of consolidating what they have learned. 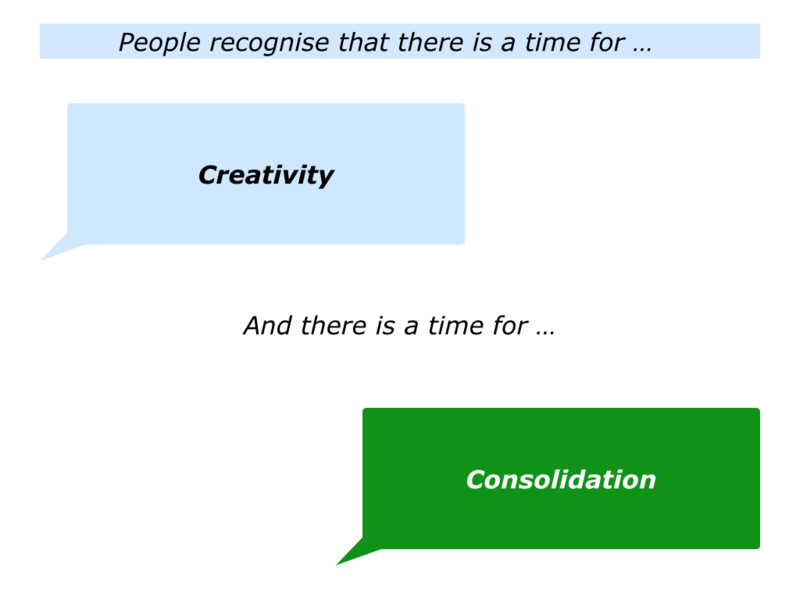 There are many definitions for consolidation. Here are some of them. To bring things together into a unified whole. To organise the key components and make them firm. People often go through this process when exploring ideas, doing a project, tackling a challenge or whatever. They go through the stages of opening up and closing down. Making sense of what they have learned, they create a platform for going on to the next stage of their journey. People sometimes go through similar steps during certain stages of their lives. 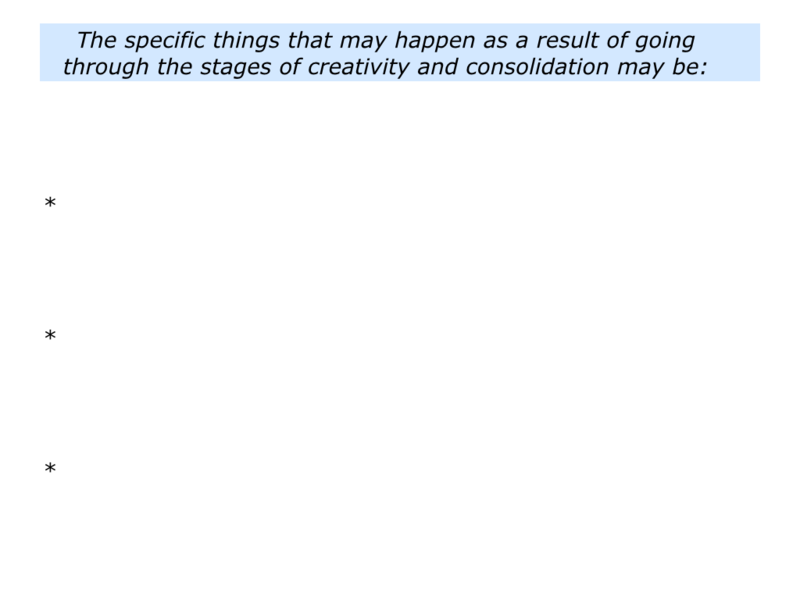 They go out into the world, explore many possibilities and then set aside time to consolidate. Building on the best from the past, they move on to the next stage of their development. 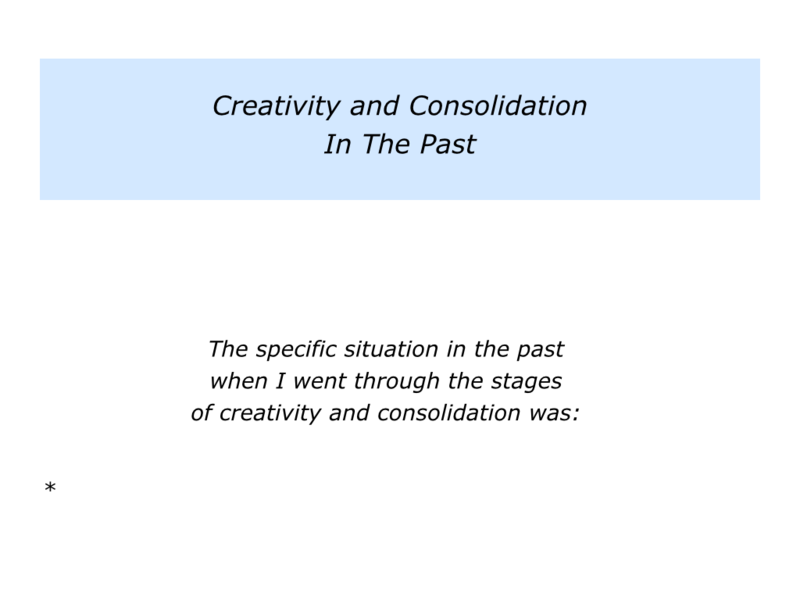 Describe a specific situation in the past when you went through the stages of creativity and consolidation. 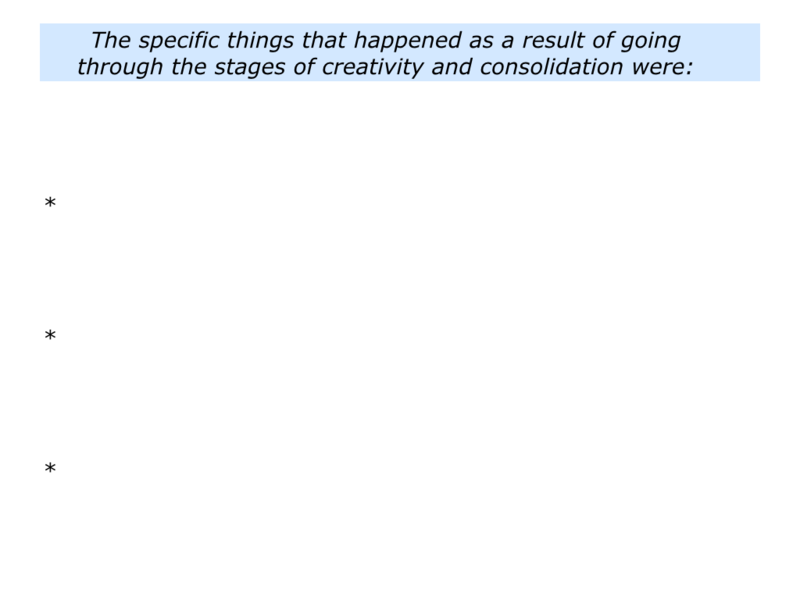 Describe the specific things that happened as a result of blending creativity and consolidation. Different people take different routes towards making this happen. Some people are attuned to their creative rhythm. 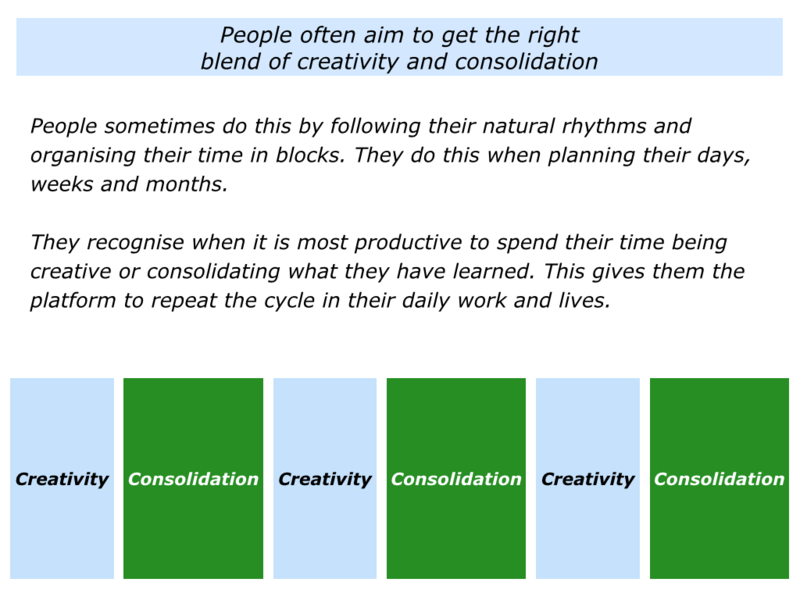 They recognise the most productive times of the day, week or month for them to focus on creativity or consolidation. A writer may recognise their prime times – the times when they have most creative energy. They may feel most creative, for example, in the mornings. Sometimes they may also have further creative bursts at various times in the afternoon and evening. Bearing this in mind, they organise their time in blocks to make the best use of their energies. Sometimes they will do creative work. Sometimes they will consolidate their output. 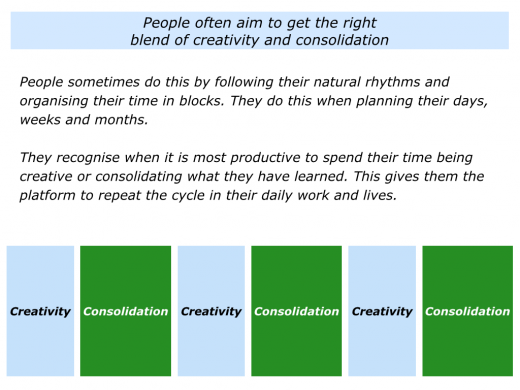 Creative people also build in time for revitalisation. They set aside time for walking, resting or simply pottering around. They may also find that this helps to consolidate their thoughts. People may sometimes spend several weeks doing creative work. They may then need to spend months consolidating the ideas and creating a platform for future development. Some people follow a similar process as they get older. 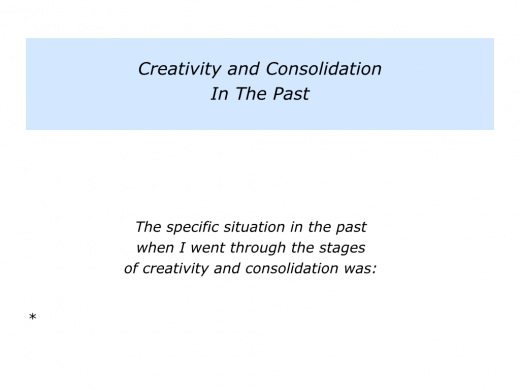 The periods they allocate to creativity and consolidation can then become longer. 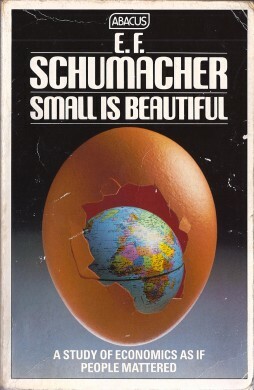 E.F.Schumacher, the author of Small Is Beautiful, embarked on this approach as he got older. Writing in her book, Alias Papa, his daughter Barbara Wood described how Fritz, as he was known, reached this point when he was sixty. He left full time work with the Coal Board to write the books that had been in his mind for years. Barbara explains that Fritz talked about Konrad Adenauer and Winston Churchill both starting new and successful lives at the age of sixty. So why shouldn’t he? “Schumacher’s Small is Beautiful is an appeal to the deep instinctive understanding of the common good that all people share. “It is an appeal to our essential humanity. It deals with some of the most pressing concerns of people the world over, concerns which every generation must consider and answer. “What is Education? What is Knowledge? What is Wisdom? What is the source of true happiness and wellbeing? The modern economist, said Fritz, measures the standard of living by the amount of annual consumption. This assumes that people who consume more are better off than those who consume less. Different people use different approaches to doing fine work. 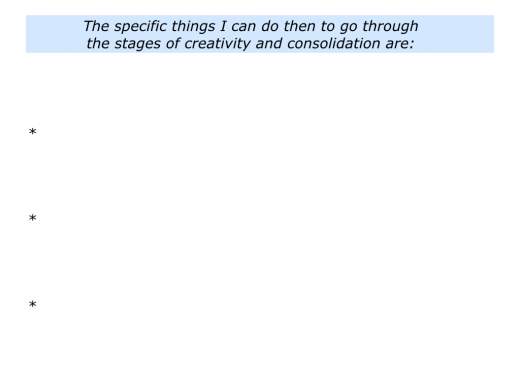 One approach is to blend creativity and consolidation. They may do this during a day, week, month, years or during the stages of their lives. Looking ahead, can you think of a situation in the future when you may want to get the right blend? You may be embarking on exploring a topic, doing a project, passing on the knowledge or whatever. 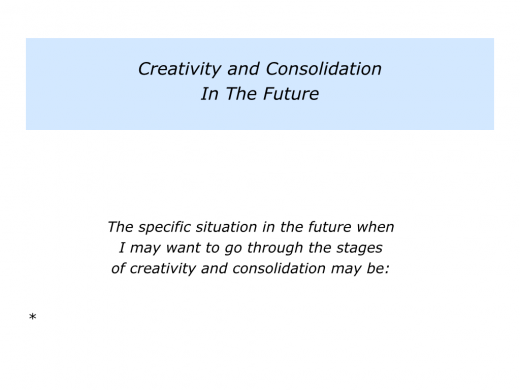 Describe a specific situation in the future when you may want to go through the stages of creativity and consolidation. Describe the specific things that may happen as a result of blending creativity and consolidation.